Horntail or wood wasp is the common name for any of the 150 non-social species of the family Siricidae, of the order Hymenoptera, a type of xylophagous sawfly. This family was formerly believed to be the sole living representative of the superfamily Siricoidea, a group well represented in Paleogene and Mesozoic times, but the family Anaxyelidae has been linked to this group as well. Siricidae has two sub families, Siricinae and Tremecinae. Siricinae infest needle-leaved trees and Tremecinae infest broad-leaved trees. There are ten living genera placed in the family, and an additional three genera described from fossils. The last tergite of the abdomen has a strong, projecting spike, thus giving the group its common name (the ovipositor is typically longer and also projects posteriorly, but it is not the source of the name). A typical adult horntail is brown, blue, or black with yellow parts, and may often reach up to 4 cm (1.6 in) long. 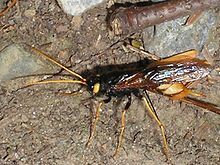 The pigeon horntail (Tremex columba) can grow up to 5 cm (2.0 in) long (not counting the ovipositor), among the longest of all Hymenoptera. Female horntails lay their eggs in trees. The larvae bore into the wood and live in the tree for up to two years, possibly more. They typically migrate to just under the bark before pupation. The spiral groove on the ovipositor is visible on the photograph but not easily to the naked eye. "as stiff and straight as a needle, polished black, with slight notches in the pointed half. It is hinged, to permit of its being turned at right angles to the body. . . the female selects a tree that is not too healthy, and settles on the bole; then, turning down her boring instrument on its hinge, she drives it through the thick bark to the solid wood." When we consider the small size of the insect, it seems remarkable that she should have muscular power sufficient to force that slight auger through such resistant material; but that the boring imposes no strain upon her is shown by the fact that she may make several experimental punctures without an egg passing; apparently the wood reached is not quite suited for her purpose, so she tries another spot. Often her operations are upon a tree that has been felled for the builder's use; and by this means the new generation finds its way at times into our homes. Having satisfied herself that at last she has found the proper conditions under which a larva could exist, she passes an egg into the wood; then she repeats the process at some other spot on the same tree or log. Members of 3 genera of horntail Siricidae attack dying or recently killed balsam fir and spruce (Rose and Lindquist 1985). The common name derives from the stout, spine-like structure at the end of the adult's body, which is used to pierce the host's bark to allow the eggs to be inserted into the wood. Populations increase rapidly only where brood material is abundant. The life cycle usually requires 2 years, and the adults are usually in flight from late July to early September. Full-grown larvae may be up to 215 mm long. Wood-rotting fungi found in horntail tunnels cause very rapid deterioration of the wood and quickly reduce opportunities for salvage. The right conditions having been found and an egg discharged through the boring instrument, from this in due course issues a six-legged, whitish larva, which sets to work with capable jaws on the solid wood, beginning the excavation of a long tunnel that will occupy several years before the larva is full-grown. That stage reached, it spins a silken cocoon, and changes into a pupa which has all its limbs of maturity formed and folded beside its body. Before making its cocoon, however, it takes the precautionary measure of advancing its tunnel close up to the inner bark, so that in its winged state it will have only to bite a way through this softer impediment to its liberty; not that it is now incapable of dealing with anything firmer. Like the caterpillar of the Goat-moth, it does not hesitate, if necessary, to make a way even through soft metal. There is a record of a Sirex-infested tree having been cut into rafters which were used in building a roof and covered with sheet-lead an eighth of an inch thick . One of the rafters contained a Sirex in either the larval or pupal stage; and when the adult insect sought its freedom, it found the way obstructed by the lead. It went right through, apparently finding lead not much more difficult to deal with than bark. It[who?] adds that an ichneumon wasp (Rhyssa persuasoria) lays parasitic grubs in Sirex, which kill them. The female wood wasp lays eggs inside trees, and its methods of doing so have inspired scientists to come up with new and safer surgical probes that are said to be more efficient. 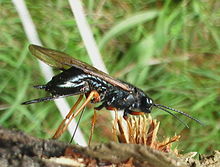 The wood wasp ovipositor contains two interlocking valves. Each valve is covered with teeth that are backward-facing. While the teeth of one valve catch onto the wood to provide resistance, the other valve moves forward taking a slight step. Then that valve catches the wood to provide resistance while the first valve moves forward. Thus by quick oscillation, the valves alternate in providing resistance and moving forward. This process leads in the ovipositor drilling almost an inch into the sapwood. The force used for this process is minimal. Buckling or breaking does not take place during the process. Researchers and scientists have been inspired by the ovipositor of the female wood wasp. They have created a prototype neurosurgical probe that works on the same principle. Its needle is silicon. It has two valves that oscillate. Each of these valves has teeth that are micro-sized. This enables it to penetrate deep into the brain causing little damage. According to the New Scientist magazine, "Unlike existing rigid surgical probes, the device will be flexible enough to move along the safest possible route, bypassing high-risk area of the brain during surgery, for example". A probe like this would considerably reduce the number of incisions necessary to access areas that are difficult to reach. ^ a b c Schiff, N. M.; Goulet, H.; Smith, D. R.; Boudreault, C.; Wilson, A. D.; Scheffler, B. E. (2012). "Siricidae (Hymenoptera: Symphyta: Siricoidea) of the western hemisphere". Canadian Journal of Arthropod Identification. 21. doi:10.3752/cjai.2012.21. ^ Kuramitsu, Kazumu; Kosaki, Atsuya; Ishihara, Teruhito; Yamada, Hideo; Watanabe, Kyohei (2016-10-28). "Infestation of the woodwasp Tremex apicalis Matsumura (Hymenoptera, Siricidae) on the large-leaf dogwood Swida macrophylla (Wall.) with biological notes on its parasitoid wasps". Journal of Hymenoptera Research. 52: 71–79. doi:10.3897/jhr.52.10060. ISSN 1314-2607. ^ Wedmann, S.; Pouillon, J. M.; Nel, A. (2014). "New Palaeogene horntail wasps (Hymenoptera, Siricidae) and a discussion of their fossil record". Zootaxa. 3869 (1): 33–43. doi:10.11646/zootaxa.3869.1.3. PMID 25283896. ^ Archibald, S.B. ; Rasnitsyn, A.P. (2015). "New early Eocene Siricomorpha (Hymenoptera: Symphyta: Pamphiliidae, Siricidae, Cephidae) from the Okanagan Highlands, western North America". The Canadian Entomologist. 148 (2): 209–228. doi:10.4039/tce.2015.55. ^ Richards, Guy. "Wasps play part in surgical probe". Materials Worlds Magazine. Retrieved 10 May 2012. ^ Frasson, Luca; Parittotokkaporn, Tassanai; Davies, Brian L.; Rodriguez y Baena, Ferdinando (2010). "Early developments of a novel smart actuator inspired by nature". International Journal of Intelligent Systems Technologies and Applications. 8: 409–422. doi:10.1504/IJISTA.2010.030220. Bugguide.net. Description and images of Siricidae of Northamerica. This page was last edited on 14 February 2019, at 03:20 (UTC).